With thorough understanding of this business industry, we are engrossed in providing Supermarket Invoice Software to our clients. Due to personnel dedication and knowledge helps us to meet the detailed needs of the clients within the given period of time. We have adroit employees, who offer these services in agreement with the defined guidelines. 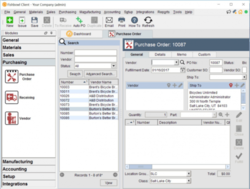 Technobase’s Material management software Inventory is powerful inventory management software that takes care of your inventory, purchases, sales orders, payments and fulfillment. It tracks sales, expenses, input tax and more. It is easy to use and customize. Assisted by a crew of trained personnel, we are presenting Weighting Scale Production and Inventory System service, which is implemented by personnel who are proficient at their job and easily accomplish the diverse necessities of the patrons. Additionally, we are highly accredited by our patrons for offering these services at reasonable rates. It’s an Internet-based back office software system for convenience stores and gas stations. It will give you total control over inventory, personnel, pricing and margins and help you improve your operations and your bottom line. We provide great invoice and billing software in nagpur for any business at cost cutting price. Our billing software can simplify your billing and save your time and money. You don’t have to hire an accountant to use billing software. Install our software and increase your productivity immediately! This module manages all inventory items required for hospital with central governance. Major operations includes, process requisitions, PO generation, receipts/Issues, reorder stock and etc. Boost your business with the power of cloud technology. "Cloud Inv" is inventory, accounting and billing solution for any type of business. It is fully managed and fully automated web-based service. Our solutions help management to reduce the overall costs, increase productivity, improve the business standards and consequently strengthen democratic values and community civic responsibilities. Increase data accuracy by implementing Automatic Identification and Data Capture techniques and technology. We provide barcode solutions which include barcode printers, Image/Laser Handheld, Wireless scanners, Hand Held terminals and customized software. Customised Software as per business needs. MIS report, User invoice entry and print. • Very simple process of making Menu Card. • Sorting the Items (by division, group, kitchen, tax, units). • Unit conversion for maintaining the stock. • Item Price subject to Table & Room selection.